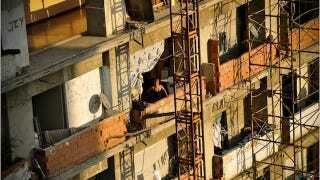 Squatters in Venezuela have found a home in an unfinished 45-story skyscraper in Venezuela. They call their home the "Tower of David", after the financier who tried to build it in the '90s. People live up to the 28th floor in the elevator-less building and have jury-rigged electricity and water to every inhabited floor. Some of the squatters even have DirecTV satellite dishes set up. It's amazing, given that many floors on the buildings don't have guardrails, windows or even walls. But the people have managed to live given their conditions. There's a bodega on nearly every floor, guards with walkie talkies protect the building's entrances and even a pseudo-arcade for the children to play.